From Rogers, Penelope Walton. 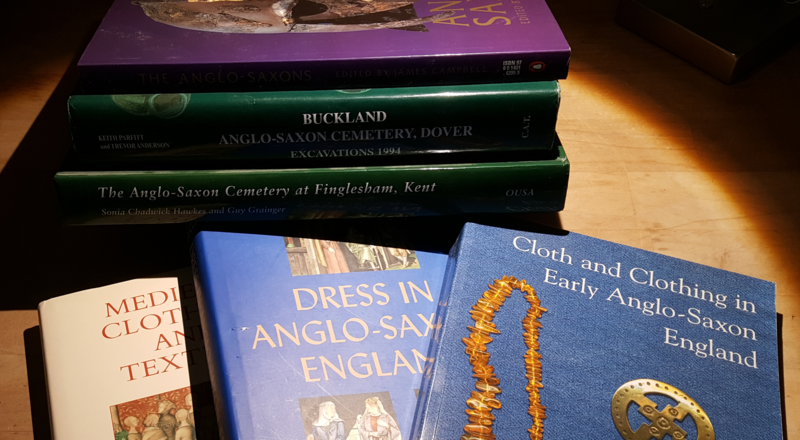 Cloth and Clothing in Early Anglo-Saxon England (p 190). 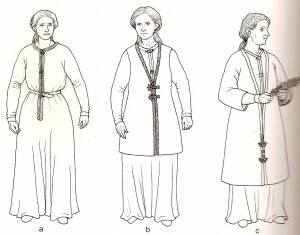 A: Kentish Dress Style III – a garment with a vertical front opening clasped by two brooches, one at the throad the other centre-chest, and worn with a buckled belt. B: Kentish Dress Style IV – the same as Dress Style III but with the addition of a front-opening coat or jacket on top. The coat/jacket was fastened by a pair of crossways bow brooches, either at the waist or immediately below, the jacket being worn ourside the belt. The women used both imported and Kentish-made brooches to fasten these garments and bordered the front edges of the jacket with their Jutish-style tablet weaves. I’m going to focus on Dress Style III and IV. I believe under all of this would be a chemise but I have no proof of that. – Chemise – no current info about this. 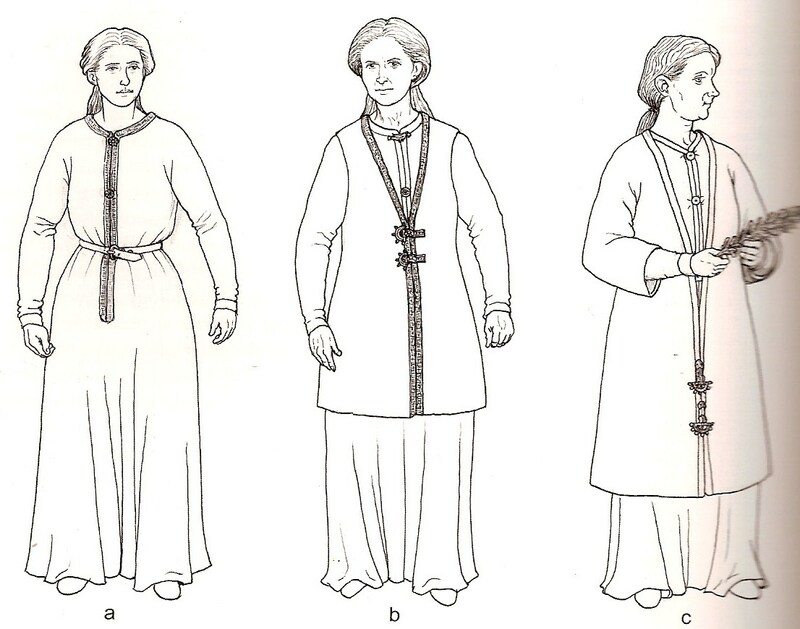 I plan to make a standard rectangular construction white linen under-tunic that goes to between my knee and ankle, with sleeves that go almost to my wrist and finish the neckline so it’s hidden under the tunic. – Braisses – I also plan to wear braisses for comfort though I have no proof about these either. – gold brocaded tablet woven strap. How prevalent? Restricted by age? – Closed rings/staples. How prevalent? How are they used? As far as I can tell, there are no earrings in the finds it may imply that the ears were covered. If the closed ring/staple was used to attach the brocaded strap to something.. you have to wonder.. why didn’t they just sew it. Tablet weaving can be sewn through.. so the staple would be unnecessary. I think it was doing something else. Possibly attaching it to leather? The article about the gold braids says that these have only been found at the head level. Meaning that brocaded tablet weaving does not show up on the edges of the front opening of the tunic or jacket. The only example of tablet weaving found away from the head seems to be a cloak edging or baldric in a man’s grave used near his sword. – What type of fabric is it made of? – How far down does the front opening go? ankle? navel? – How are the edges of the front opening finished? Rolled hem? binding? Tablet weaving? – How prevalent is the “button loop”? – How prevalent is the “wrist cuff”? – “They” say the anglo-saxons wore metal bracelets at the end of the sleeves is there any proof of that? – Always belted? Sometimes belted? – What kind of tablet weaving? how wide, what material? 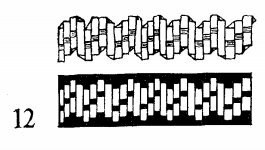 – The threaded in Anglo-Saxon belt found on a strap end may actually date to the 15th century and may not be a good item to use on a 6th century outfit. That said.. it’s pretty.. so I may do it anyway. – If not tablet woven.. what were the belts made out of? – Strap ends? only on men’s or on women’s as well? – Any other plates on it? – What kind of shoes?